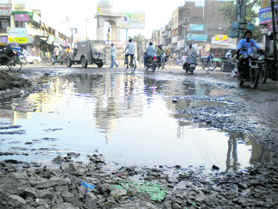 Enraged over the alleged failure of the district authorities to drain out rainwater accumulated in Chhotu Ram Nagar here for the past one week, residents of the locality and the nearby areas stopped the Delhi-Jind passenger train by sitting on railway track adjacent to the locality today and reportedly pelted passengers with stones. You may find the unpalatable reality hard to digest, but cooks preparing food for the Haryana police have actually been “deprived of their right to food” - at least this is what the Punjab and Haryana High Court believes. It has also held that the state authorities have been “unfair” towards the cooks and other such employees by giving them just about Rs 2,000 a month as remuneration. Former Chief Minister Om Prakash Chautala said here today that henceforth reservation in jobs should only be given on economic basis. Talking to mediapersons, he said all communities which had been given the benefit of reservation in the past should continue to get it, but in the future the basis for any further reservation must only be the economic status. Threats of protests by activists of the Jat Arakshan Samiti, potholed roads and poor sanitary conditions haunt the arrival of Queen’s Baton Relay in the district on Sunday. Confusion over the names of the VVIPs, who are to receive the baton on its entry in the state and to remain with it during its sojourn in Sirsa, has been compounding the problems further. Residents of Tohana town and surrounding villages have been doing almost without power for the past two days due to a major snag in the 132 kV power substations there. Sources in the DHBVN said two high-voltage transformers of 16 MVA and 20 MVA capacities got burnt in the substation as lightning struck them on Wednesday during the rainfall. The union government has formulated an ambitious Rs 17,400 crore National Dairy Plan aimed at increasing the milk production to 180 million tonnes by 2021-22 and expand the processing capacity to handle 65 per cent of marketable surplus milk. 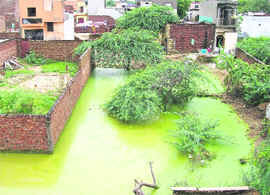 The Yamuna waters have inundated many areas in Faridabad and Palwal districts. Farmers are a worried lot as their fields have been submerged. However, the water level in the river started receding this afternoon, promising respite for the time being to the authorities concerned and the villagers. A youth hailing from Rawalwas Khurd village near here was shot dead inside Midway Dhaba on Balsamand Road late last night. Identified as Rajesh Bamal, the youth had gone there for dinner with his friends. He was followed there by another youth from the village and his four companions. Tripta Sharma, vice-president of the Fatehabad district unit of the BJP, today quit her party and joined the Congress. Usha Dahiya, district president of the Mahila Congress, played a major role in her switching over to the Congress. At least six vehicles, including motorbikes and scooters, and two houses in the locality were reportedly set ablaze by the violent mob. However, the fire was extinguished before it could spread. Over 50 persons sustained injuries in the incident. The police failed to control the situation despite being informed about the incident well in time. According to reports, hundreds of residents of Chhotu Ram Nagar and the nearby areas assembled neat the railway track in the morning and blocked it by staging a dharna there. They were demanding that the rainwater, which had accumulated in the locality, be immediately drained out. “We have been facing a lot of hardship due to a flood-like situation in Chhotu Ram Nagar owing to the apathetic approach of the authorities concerned, who have failed to remove the stagnant water,” said a resident of Chhotu Ram Nagar. 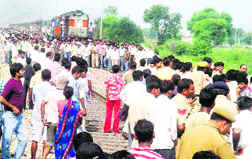 The protesters reportedly sat on the track when they saw the Delhi-Jind passenger train approaching from the Rohtak side. As the train stopped there, the situation took an ugly turn when the protesters attacked the passengers, who got down from the train to find out what had happened, with stones. In retaliation, the passengers also started throwing stones on them. Both parties reached the locality where some motorbikes and scooters were set on fire by the mob. Two houses were also torched but the fire could not cause much damage as it was controlled well in time. The Bahadurgarh SDM and police officials reached the spot but failed to control the mob. Extra police force was called in following which the situation could be brought under control. The train left for Delhi after three hours. Later, the Jhajjar SP and the DC also visited the spot and took stock of the situation. SP Sourabh Singh said two cases had been registered against those who indulged in the violent clash. “Cases of disrupting rail traffic and damaging government property, besides causing injuries to several persons, have been registered by the railway police and the Haryana police, respectively, in this connection,” said the SP, adding that over 20 persons had been rounded up in this connection. Deprecating their approach, Justice Ranjit Singh has chided them for being insensitive to the employees’ plight. The scathing observations came on a petition by Ram Harsh and 24 other employees. In their petition against the state, the Director-General of Police, the Kurukshetra Superintendent of Police and other respondents, the petitioners had sought directions for setting aside the action of reducing their pay from Rs 2,840 to Rs 1,920 with effect from March 2009. Employed as cooks, water carriers, sweepers and gardeners in the Haryana police as “contingent part-time employees”, the petitioners had dubbed the action as “illegal, arbitrary and violative of principles of natural justice”. Taking up their petition, Justice Ranjit Singh asserted that the Kurukshetra SP, present in the court, was insisting that the pay was reduced as work for only four hours was being taken. Coming down heavily on the SP, Justice Ranjit Singh asserted that the officer had failed to realise that the employees, after these four hours, would hardly have any place to go or look for other work. Justice Ranjit Singh added they were earlier being paid for seven hours’ work. Apparently, there had been no reduction in the work. Only a reduction in the pay. This attitude of the respondents was “unfair”. Justice Ranjit Singh said it was difficult for a person to survive with a meagre amount of Rs 2,000. “Some petitioners are working as cooks and cooking for police constables, but are being deprived of their right to food,” Justice Ranjit Singh observed in the open court. Before parting with the order, Justice Ranjit Singh directed the placing of the matter before the higher authorities concerned for reconsideration. He said reservation was being sought because of rampant unemployment and lack of jobs. The best solution was to create more jobs so that members of all communities could earn a living honourably. This is the first time that Chautala has clarified his stand on the demand for reservation by the Jat community. He had been under tremendous pressure from the Congress and other political parties to spell out his stand. Asked who was behind the Mayyar violence, Chautala said people should draw their own conclusions but they must consider that though the crowd was from Haryana but Jat leaders from Uttar Pradesh were leading them. Congress leaders had been seen at press meets of these men from UP, he added. He ducked a question on whether the threat by Jat leaders to disrupt the Commonwelath Games was justified. However, he said he had his doubts on whether the Games would be held at all. He said the allegations of graft in the staging of the Games should be thoroughly probed. The former Chief Minister said had the SYL Canal been completed, there would have been no floods in Haryana. He criticised the Hooda government for failing to manage the flood situation. He said the government had not even ordered a special girdawari to assess loss to farmers. FATEHABAD: Chautala said the Jats, who had been threatening to create hurdles in the Games, should think of national pride first. Chautala was here to head a meeting of his party workers and extend his support to the Gorakhpur farmers sitting on dharna against the acquisition of their land for the nuclear power plant. Addressing Gorakhpur farmers at their dharna site opposite the mini-secretariat, Chautala alleged that the state government had mortgaged the interests of farmers by approving the nuclear power plant on their fertile land. The Queen’s Baton Relay, which will enter the state from Chautala village here on September 26, will stay for the night in Sirsa and then proceed on its further journey towards Delhi for the Commonwealth Games the next morning. The baton and the team of sportspersons and officials accompanying it will reach Chaudhary Dalbir Singh Indoor Stadium in the afternoon after receptions in Chautala and Dabwali and then will proceed to Tara Baba Kutiya managed by state minister Gopal Kanda’s family. The baton relay will proceed towards Shaheed Bhagat Singh Stadium in the evening passing through Jagdev Singh Chowk, Bhagat Singh Chowk, Parshuram Chowk, Ambedkar Chowk, Lal Batti Chowk, Old Court Road and the Barnala road. All these roads are in a very bad condition due to potholes and the recent rains have aggravated the situation further as waste matter and stinking filthy water can be seen overflowing on the roads. Lack of coordination between the Public Works and the Public Health Department was coming in the way of quick repair of roads, said a source. Sirsa DC CG Rajini Kaanthan said the recent downpour had deteriorated the condition of roads, but the repair works were being done on a war footing. Threats of protests by activists of the Jat Arakshan Samiti are also posing a serious challenge for the successful stay and passage of the baton relay. “We will not disclose the kind of protest we are going to register against the baton relay, but our members will definitely oppose it wherever they find an opportunity,” said Sharvan Dudi, district president of the Jat Mahasabha. Meanwhile, confusion prevails over the names of the VVIPs, who are to receive the Queen’s Baton Relay at various points in the district. As per an earlier programme, Minister of State for Sports Gopal Kanda was to receive the baton at its entry in the state at Chautala village. The authorities have now announced that PV Rathi, president of the Haryana Olympic Association, will receive the baton at Chautala. Meanwhile, the police has made elaborate security arrangements for the safe stay and passage of the baton relay. “Two companies of the Rapid Action Force, five companies of the Haryana police and jawans of the district police will stay guard along the route as well as the places of stay of those accompanying it,” said SP Satinder Kumar Gupta. He said the police would sternly deal with the disruptive elements. The transformers - 132/11 kV for local supplies and 132/33 kV for two 33 kV power substations situated in villages - were totally damaged. The total loss to the power utilities is being estimated to be over Rs 4 crores. Sources said the replacement of these transformers was a huge and time-consuming task and it might take another five to six days. “We had not received more than four hours of power in the past two days and due to that water supplies have also been hit,” said Satbhushan, a local resident. He alleged that the DHBVN authorities had not been giving any satisfactory answers to their queries. However, chief communication officer of the DHBVN DP Dhull said the transformers had already been allocated and the works on their installation would be started soon. He said two out of the four transformers had been burnt, forcing the authorities to go for load shedding. He said the DHBVN authorities had been providing power supply to all areas on turn basis. Unfolding the plan while inaugurating a two-day national seminar on “Indian Dairy and Food Industry - Future Road Map for Sustainable Growth” at the NDRI here today, Dr Amrita Patel, chairperson of the National Dairy Development Board, said in order to increase the processing capacity from 30 per cent to 65 per cent, milk procurement would have to be increased from 46 million tonnes at present to 160 million tonnes by 2021-22. She suggested that balanced feeding of existing animals alone could help in increasing the milk production by 15 to 20 per cent and at the same time reduced the emission of methane (a gas produced by animals that depletes the ozone layer) by 12 to 15 per cent. Presiding over the inaugural session, Dr AK Srivastava, Director of the NDRI, said India had a large population of cattle and buffalo with the lowest cost of milk production. The conference is being attended by over 500 delegates. In the past 24 hours, flood waters have entered Kabulpur, Bopani, Tilori, Amipur and Mohana villages in Faridabad subdivision and several villages in Ballabgarh subdivision, including Chaisa, Motuka, Arua, Fhajupur, Godasan, Manjhauli and Dulepur. Residents of Manjhauli and Dulepur were shifted to a relief camp as flood waters entered the residential areas. In the adjoining Palwal district, the situation is still grave with more than 30 villages flooded. At first they caught hold of Rajesh Bamal and assaulted him. However, he was able to free himself and ran towards his friends. But the assailants fired two shots at him. He was taken to a hospital where he succumbed to his injuries. The police has registered a case. A family member of the deceased said rivalry during the recent panchayat poll was the cause of the murder. Tripta Sharma, vice-president of the Fatehabad district unit of the BJP, today quit her party and joined the Congress.Usha Dahiya, district president of the Mahila Congress, played a major role in her switching over to the Congress. Tripta filed her membership form for entry into the Congress in presence of Sirsa MP Ashok Tanwar, Chief Parliamentary Secretary Prahlad Singh Gillankhera and district Congress president Randhir Singh. She said she was feeling disillusioned in the BJP.